Now that 5% deposits are available through 'Help To Buy' schemes, many stay at home adults, who lost hope of buying their first home, suddenly have to find a cash lump sum and many sell their car as quick a solution. 13.6% did so to raise cash or because they no longer needed a car. According to analysts at the car review site, not all of these were people in their 20s but they made up a disproportionate percentage of those who recently sold their cars. Individual results in the WeLoveAnyCar.com survey have highlighted what is set to become a trend; stay at home adults who need to raise the deposit quickly before the opportunity to step on the housing ladder disappears. One Volkswagen car reviewer told WeLoveAnyCar.com, "This was my first car and I loved it! I even bought it after my lease contract ran out..... I was buying my first house so i had to sell it and share my partners Polo." 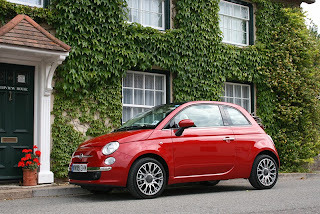 Beloved Fiat 500 or a deposit on a house? Although some stay at home adults have stored up savings, many have spent their cash on cars. Insurance group Aviva found, in their 2012 Family Report, "the driveways of Britain were becoming clogged with the cars of stay at home kids." Now, with 'Help To Buy,' prospective homeowners may 'Have To Sell' their cars. Another trend seen over the last 10 years is the movement of people to the centre of towns and cities where 'no car' is an option. The convergence of these different factors; the need to raise deposits, availability of housing in towns and better public transport may mean more and more people turn their back on the car because it is practical and a necessity. A spokesman for WeLoveAnyCar.com said, "When we look into what people are saying, through this and other surveys, it is clear that some young adults see their car as a potential solution to a problem they thought was insoluble. Faced with living at home, the car has been seen as the only place they could call their own. However, with 'Help To Buy' these same people are realising they may 'Have To Sell' to get a home of their own." Another car reviewer clearly loved his Audi A4 Cabriolet but, in his words, "Loved the car, only reason i sold it was due to buying a new house..." Another Peugeot car reviewer said, "Loved this car, was only sold to finance house purchase. Wish I still had it, loved the space and comfort." WeLoveAnycar.com is the biggest car review site in the United Kingdom with over 70,000 car reviews submitted in the last year. The site has car reviews on most makes and models of car and is free of charge.